The challenge is to take all the information that’s flying at you, filter it and leave with a plan for how you are going to use it in the future. The key to this is time management. This is what my “conference clock” used to look like. I thought that the sessions were where the bulk of learning took place. I ended up spending most of my time in sessions, or better yet – WAITING for session after session. Don’t get me wrong, the sessions can be great but they are not your singular opportunity for learning at conferences. I’m not sure what your conference clock looks like – but today I want to challenge you maybe rethink your plan for how and where you will spend your time. This particular tip is most relevant to large conferences like ISTE. A specific way to think about how to spend your time is in the expo hall. After years of not being able to see it all, I now section off the map. Plan out which section you will see on each day. This way you see it all in a timeframe that’s not overwhelming to the brain, or the swag bag that’s sure to be heavy! Taking photos is a GREAT way to record and remember what you see. BUT be careful not to simply take pics because you will end up with hundreds of photos to sort through. Have a plan for tagging them, so you don’t end up with a camera roll full of random pictures. One way I do this is by emailing pictures to myself as I take them - quickly jotting down a note in the subject line. I also do this for QR codes. I use i-nigma to scan and email QR code links to myself. When I get back to my computer, I can file them, share them and make notes as needed. There are also lots of handy apps - like Evernote, that can help you with this. You are going to collect a LOT of stuff. A tip: only take what you need. Sometimes I won’t even take the flyer, - unless I really need it – or plan to give it to someone else when I get back. I'm not afraid to say “this doesn’t really apply to me, but thanks so much anyway”. Remember it’s your time! Also, a lot of the fun swag we collect gets lost in the shuffle. Have a procedure for converting paper to a digital file for easy storage and sharing. Before all those little trinkets go to my 5 year old, I snap a pic in evernote and tag it so I know to go back to it. Evernote will also search your images for text. Try the Scannable app from Evernote. We are all guilty of multitasking. But research reallyshows that it is not best practice. I have challenged myself to really be present in the sessions I am in and the conversations I am having. My email can wait. You only have a few days here – challenge yourself to really focus. 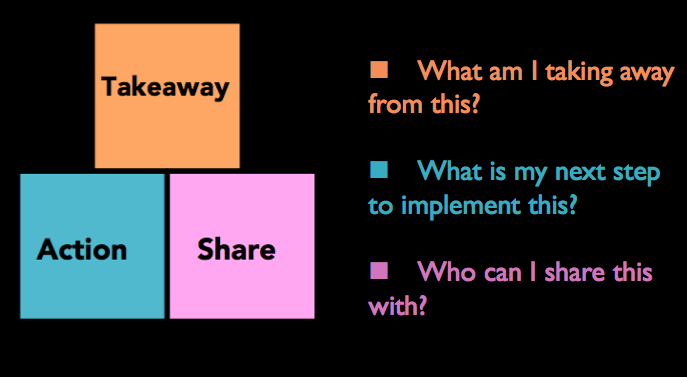 In every session you attend, boil the message down to one key takeaway. We have short memories, so it’s important to break information down into small, usable chunks that we can recall and apply later. Ask yourself… what resonated with you? what can you apply in your world? When your are back in your environment the takeaway will trigger application. How are you going to keep track of your learning? One way I do this is by using a simple Google doc (see pic of sample doc at the bottom). This also helps me deal with the fact that I can’t possibly attend all that I want to. I use the online planners/apps provided by the conference and a Google spreadsheet to cut and paste info on BOTH the sessions I plan to go to and the ones I can’t make it to. Why? Because a lot of the content is available on the presenter’s website, or can be received by sending a quick email. Why use a google doc? Think – save, search, share! It is easy to search. Using the handy "command + F" feature helps me to search my notes quickly. In one column I’m sure to include is the “key takeaway” (as discussed in #6). The conference guide book & app are great – but I’m not really going to take the time to go back either of them once I get home. This helps me to organize the program to fit my needs. Another way I organize my notes is through Evernote. Evernote has ENDLESS possibilities. 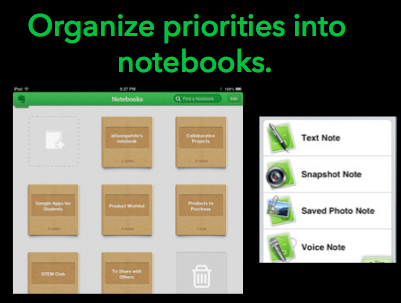 In evernote, everything is organized into notebooks. Before a conference, I create notebooks for each area I want to collect information on. Then I add notebooks as I need them. Even more important that notebooks, is the tagging system you use. Spend some time setting up your tags. Tags give you the ability to group your notes in ways you can understand. 8. Don't be afraid to go old school. I’m an artistic person and sometimes I just need a break from the “resource collecting”. I embrace the need to relax and just HEAR the message someone is sharing. For these more, motivational talks – I bust out my notepad and Sharpie and listen, doodle and draw. There are a lot of ways to do this and a lot of apps that can help. Again in evernote, I like the business card feature that allows me to scan a card and add it directly to my contacts. Use a method that works for you. Try the Scannable app from Evernote. I like to have a "digital business card" handy. For this I create a QR code of my website (and my contact info) and set it as my iPhone screensaver, making it easily accessible for others to scan. *If you don't have a blog or website, you can link your QR code directly to your contact info. QR code generators like qrstuff.com allow you to do this. 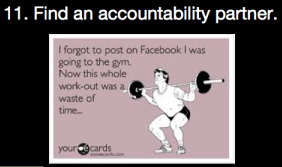 This picture is funny but I’m not talking “facebook accountable”. I’m really talking about finding someone during the conference that has a similar job role as you. Exchange contact info and set a few goals. Discuss how you want to implement what you learned and check in with each other – once a month – or whatever time frame you set. But do it – because accountability leads to movement, implementation and change! Remember to be an inspiration to others too. When I give talks on this topic, I spend a few minutes talking about this final piece because it’s a term we hear so often that we usually end up ignoring it. But really think about how what you learned is going to change the way you teach, coach or learn. 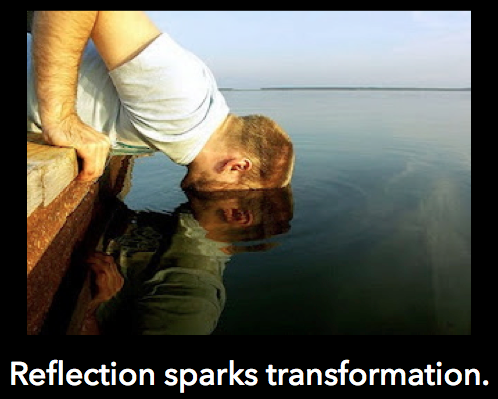 This is how I do reflection. I think "S-A-T" and jot those three letters down into my reflection notes. I know I’m not done reflecting, till I’ve answered all three. What am I taking away from this? What is my next step to implement this? Who can I share this with?